METALS change in VOLUME in response to change in TEMPERATURE & DISSIMILAR METAL STRIPS having different COEFFICIENT of VOLUME CHANGE. 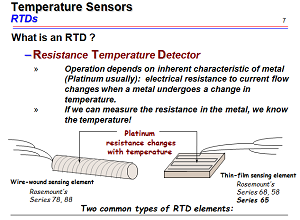 The degree of deflection of 2 dissimilar metals is proportional to the change in temperature. One end of the spiral (wounded from a long strip of material) is immersed in the process fluid and the other end attached to a pointer. A bulb connected to a small bore capillary which is connected to an indicating device. Indicating device consist of a spiral bourdon gauge attached to a pointer. The bulb is filled with a volatile liquid and the entire mechanism is gas tight and filled with gas or liquid under pressure. Basically the system converts pressure at constant volume to a mechanical movement.